The Supreme Court just ruled against working people in Janus v. AFSCME, Council 31, and in doing so, joined the dark web of corporate interests to continue the assault on all of us. This decision abandons decades of commonsense precedent in favor of greater rights for corporations. All over the country—from our public schools to the food service industry—working people are taking collective action as we haven’t seen in years. The middle class is proof that the best way to get a raise, better benefits and a voice on the job is through a union contract. That’s why these corporate elites are doing all they can to break us up. 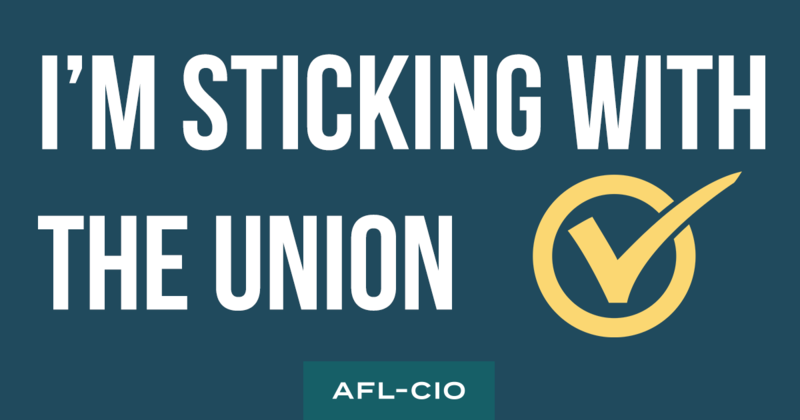 Share this graphic to let people know you are sticking with the union. Here’s the thing: We have never depended on any politician or judge to decide our fate and we aren’t about to start now. Workers’ rights are constitutional and that hasn’t changed. What has changed is the power of corporations to hurt workers. Greedy CEOs and special interests have used the Supreme Court to do the bidding of the corporations and their donors who want to weaken working people’s freedoms. Now people’s ability to negotiate together for safer workplaces, higher wages and better benefits is being threatened. This case was never about the plaintiff, Mark Janus—it is the culmination of decades of corporate attacks on working people, motivated by greed instead of what’s best for workers. That’s why working people must stand together right now to support our freedom to organize for a level economic playing field. We are stronger together—we know it and so do they. Share this image on social media to show you’re sticking with the union.